Warren Eckstein chats with MSNBC.com about keeping pet fish. Chat questions were answered on the phone through a typist. This is the transcript of that phone call. Chat producer Will Femia moderates. I bought an “African Knife” fish, which is the coolest looking thing I’ve ever seen, but it always hides in the back or behind the filter. How do I get it to swim around more? Is it my own fault for having too many hiding places in the tank? Very often when you add a new fish to an aquarium and there are many places for them to hide, they will hide in those places. One of the things I recommend is to change the aquarium monthly, get rid of some hiding places and make some new ones. Fish like those changes anyway, and this will help your new fish. Is it unhealthy to make no hiding places at all? They do need their escape routes and places too hide. But like anything else, if they become to comfortable with a certain area, it becomes an obsession with them. That applies not just to fish but to dogs and cats as well. My frogs do that as well now that you mention it. We have a 20 Gal tank and this spring we have a great deal of trouble with Algae. It is not “on” the plants and gravel it seems to be in the water, more like a “cloud”. We have cut back on feeding and kept it out of the sun the best we can, any other thought? we condition water and it has been tested and ph levels are OK. The water comes from a well of 210 ft, maybe a treatment? we use the filter you ‘prefered’ in the segment on weekend today. First, the increased algae can be caused by the temp of the water being too high or too many fish in the tank. What you may want to try is an undergravel filter as well as the whisper filter you’re using. Probably the most important thing is that in every town or city is an aquarium society, the reason I mention this is that depending on where you live, there may be some things in your water, so checking with the people in your area, either the aquarium society or even a local university to find out if they know of anything in the water that is increasing the algae growth. I’m going to be shopping for an aquarium soon. How much should I anticipate for the cost of a 30 – 50 gallon freshwater setup including the fish and which type of fish do you recommend?? Ball park we’re saying maybe 100-200 dollars. I would set it up as a community fish tank. What I would do is… you should go according to your own preference of course, but when you go to the store, ask which fish are top fish, bottom fish, and middle fish so that when you set up the aquarium, all of the water is covered by fish. I would also say it’s better to start with less than more. The rule of thumb is no more than 1 inch of fish per gallon of water. At the beginning, common sense dictates that the fish should be approximately the same size. If you’re going to get the type of fish that are school fish, always buy a minimum of 3 or 4, never just 2 or 1. I’ve been using sinking pellets to feed my Cory and Plecco fish, and now I have algee in there that looks kind of like grass. Could the food have caused the algee? Absolutely. Basically, whenever you’re using the type of foods that float to the bottom, it’s important you use a gravel vacuum more frequently, and more frequent water changes, taking the water from the bottom when you change about 20% a month minimum. Also, I like the look of the algee, and it stays under control as long as I keep scraping it off the glass. Is there anything wrong with letting it live in the tank or should I try to kill it off or get one of those algee eating fish? I would recommend an algae eating fish. Some algae may not be that detrimental, but it tends to eventually overtake an aquarium. 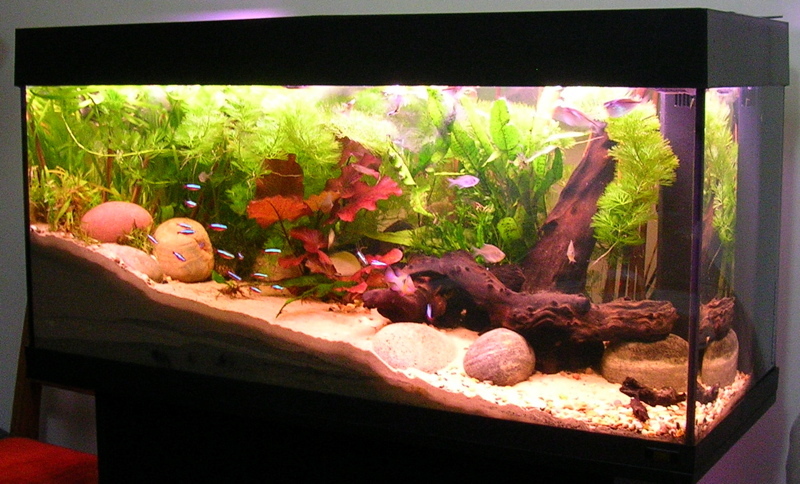 And if you like the look, I recommend some live plants, which may help control the algae problem. A while ago I bought a snail, which died pretty quickly and was soon eaten by the fish in the tank. The strange thing is that now I have little snails in there. Really little, like pebble size. They’re really neat. how can I encourage them to grow? how do you get rid of snails? In terms of the small snails, they will grown on their own, there’s nothing you have to do to encourage them. In terms of the other snails, just remove them from the tank, I’m not sure there’s a better answer than that. LOL! Are there any live plants can be used that fish will not eat? There are certain live plants, and this is where you have to work with your aquarium person very closely. Trial and error is really the only way to find out which plants your fish won’t eat. Eating small amounts of plants is not necessarily a bad thing (unless you’re a plant) 🙂 I prefer a mixture of live and plastic, not one or the other. i’m interested in extremely low maintenance aquaculture …. is there a truly biospheric tank? The best all around biosphere type tank would be a reef tank. They’re relatively expensive to start up, but if you think of it, it’s kind of like an entire ecosystem that works off each other. If you have the financial ability, it’s probably the most beautiful tank you can set up. Yes. The mechanics of the reef tank are very similar to a small town water purification system. The mechanical end circulates the water, which you don’t have in any still tank. I was recently at a fair where there was a guy selling a tiny frog in a small tank with a plant in it. He called it a complete ecosystem because the plant would eat the waste and make oxygen in the water. All it needed, he said was occasional food for the frog, and to be topped off with distilled water. Is he full of it? Id like to put a few fish in an outdoor above ground pond, together with a few plants – what can you recommend? Various types of goldfish, koi fish… the only problem that a lot of people run into with outdoor ponds is predators, like cats or raccoons, so make sure it’s predator proof as well. You lucky person, it’s great for meditating. Just try to start with fish of equal size. I don’t find my fishtank relaxing to watch at all. I have a male swordtail that picks on the others in the tank, even though these are supposed to be community fish. I end up getting stressed out watching him attack everyone. Sometimes I catch him in the net and leave him in there just to restore peace to the tank. Is there a way to teach him to be nice? how big does a fishtank have to be to support a dogfish? A dogfish is a type of shark. Again the rule of thumb is one inch of fish per gallon of water. A dog fish is big, so you’re talking about a big tank. The other thing I would recommend is that the tank is mentally stimulating for the fish. I have a big catfish whose eyes are starting to look cloudy. Is that a symptom of him getting big an old or is that something I can treat? He seems to function ok as far as eating and swimming goes. It’s probably something that you can treat. It’s real important that you do testing for Nitrites, Ph, Ammonia, and you might want to add some stress coat to the water. The rocks are fine. Again I would recommend a good vacuum to keep them as clean as you can. I would not move the rocks either if you’re afraid that they’ll crush the animals. It seems like I put a lot of chemicals into the water. Ph up, tap conditioner, stress coat, some kind of bacterial drops (brown liquid), de-chlorinator… am I doing more harm than good with all these products? Stop trying to recreate Chernobyl. 🙂 I honestly believe that many people use way too many treatments for their water. Test your water once a week, and only add what you need to keep the water stable. More people kill their fish by adding chemicals. Also remember that quick changes can cause shock to the fish, so any changes you make should be very gradual. Yes, it’s possible that it could spike the ammonia, but I wouldn’t make the change until that starts to happen. Monitor it closely, and if you see any changes you’ll have to make a decision at that point. do albino frogs need any special care and do they mix well with other fish? It can mix with other fish, one of the real important things though is to make sure the tank is out of direct sunlight or you’ll fry your frog. And I would recommend more than one. Take the size of the frog into consideration with the size of the fish. As a general rule, is it ok to mix species like that? It’s hard to make a blanket rule on that. I’ve had some real surprising pairings. Some species are more compatible, but that’s not even a guarantee. For example, sometimes turtles and fish can do well together in an outside pond, but in a tropical tank, I wouldn’t recommend them being together. We’re running past our half hour. Warren, can you give us some general words of wisdom before we have to let you go? Aquariums are fun and healthy, however, they’re not low maintenance. If you want a healthy aquarium, ask a lot of questions and become very friendly with your local pet store. I always stress the fact that when you set up the aquarium, speak to someone who’s going to be there week after week because he’s going to know the local water conditions and how the fish react. A fish or aquarium should not be an impulse buy.